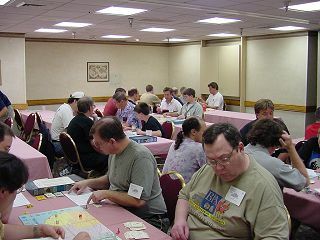 The 2002 tournament closed with a victory by Ed Wrobel in a six-player game that lasted just over 4.5 hours. 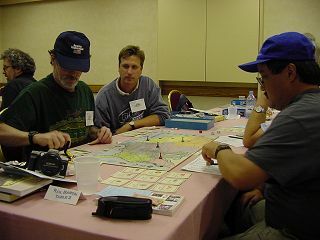 The six finalists, who had each won their semi-final game, were (in turn order) Ed Wrobel, Charles Davis, Stanley Buck, Mark Oldfield, Paul Van Bloem (ie, me, your GM), and David Weinstein. 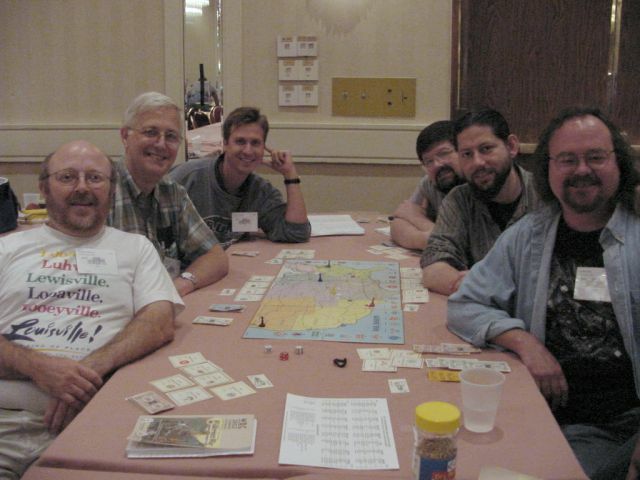 From left to right: Charles Davis, Stan Buck, Mark Oldfield, Paul Van Bloem, David Weinstein, and Ed Wrobel. Obviously, beards were the key to rolling better dice in the preliminary rounds this year. Ed started out by swapping his home city of Miami for his first destination of Kansas City (a far superior home city). Unfortunately, he did not reach the safety of the Seaboard before Charles, traveling from Mobile to Houston in one turn, bought it out from under him. Charles then headed for Detroit. When Stanley Buck bought NYC, I was fatally tempted to buy the C&O and try to get some of Ed's hard-earned money away from Charles. The downside of this was that I was stuck with the C&O, of course. The PA wasn't bought until the fourth round, when David arrived in Seattle from Detroit. When Mark bought the B&O on his next turn, the Northeast was locked up. I have noticed that turn order is very important in six-player games. This may have been the game that proved the rule, as David, going last, assembled a very good network: PA, NYNH, RF&P, SP, CMStP&P, and IC. Not the best network in the world, but it's all connected and reaches 62% of the cities. By contrast, Ed won with a network consisting of WP, ACL, UP, and GM&O, which serves only 36% of the destinations. While I'm on the subject, here is how other players' networks looked at the end of the game: Charles had T&P, SOU, SAL, N&W, B&M, and MP (38%, but B&M doesn't connect); Stanley had NYC, GN, L&N, and ATSF (61%, but GN doesn't connect); Mark had B&O, NP, CB&Q, and SLSF (40%); and I had C&O, CRIP, D&RG, and C&NW (33%). My analysis of the game suggests that Ed had only one thing going for him: everyone knew he couldn't win with that network, so they were glad to help him out by using his RRs. Well, that and his winning personality, of course. At the same time, people avoided using David's network, I think, figuring anyone with the PA and SP had to be in the lead. Ed went to a total of seven unfriendly cities, including his first trip to Miami, which is pretty good considering his network. (Everyone agrees that dice rolling is an important RBN skill!). Charles also went to seven (one of them Chicago! ), Stanley had eight, Mark five, I had eight, and David six. Interesting to note that David's unfriendly destinations were all in the second half of the game, when the price had risen to $10k; this partly explains why he couldn't come close to winning after assembling the best network. In fact, David's network was almost not connected. At the beginning of round 23, there were three RRs left unsold. Ed arrived in Omaha and bought GM&O to connect his UP/WP to his ACL. 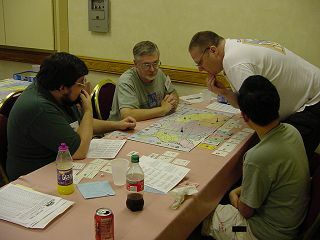 I was one short of arriving in Milwaukee and buying the IC; instead, David arrived in Philly and bought the connecting IC, leaving me to buy the SLSF next turn, and send user fees up. If David had ended up with the SLSF rather than the IC, his city access would have been almost 70%, but his SP would have been separate from the rest of his RRs. At that point, we'd been playing for better than two hours, and took a short break. This gave Mark a chance to pass around some very good cookies that John Cannon's wife had made. Judging by the cookies, we should definitely try to get John into next year's finals. Play resumed, and it became quickly clear that I wasn't going to win the game - clear to me, at least. I struggled along without a Super Chief, as did Mark almost till the end. Eventually, I auctioned the SLSF to Mark for the bargain price of $18k; dropping my city access from 38% to 33%, and raising Mark's from 35% to 40%. That was in round 42, as the game was reaching the beginning of the end (hence the low price). In round 41, Stanley arrived in Sacramento and announced he had over $150k. This was after leaving Portland ME, so both ends of his trip were unfriendly. However, each was only a few dots from his own RRs (three from the NYC, one from the ATSF), so he hadn't had to pay too much. In round 43, Ed announced, arriving in Charleston from Detroit. Stanley next traveled to Indianapolis, a friendly city for him; however, he then went to three unfriendlies in a row: Richmond, Tucumcari, and then back to Richmond. And of course everyone was trying hard not to use his RRs, so he couldn't increase his cash much. Meanwhile, Ed traveled to LA, and then Atlanta, which brought in $49k. 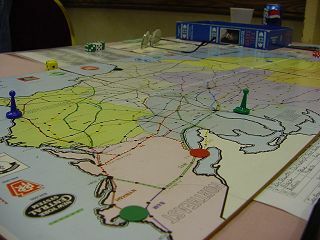 Then the game ended quickly, as Ed was given a choice of regions; he chose Plains, and rolled his home city of Kansas City. He arrived on the white dice in round 54; with his 9k payoff, he had $212k, and so declared and won. The only person close to Ed in cash was Stanley, who had $172.5k. David had 117k, Mark 83k, Charles 80k, and I brought up the rear with 61.5k. The order of finish (which counts net worth, ie cash plus value of RRs) after Ed was: Stanley 275.5, David 219, Charles 161, Mark 160, and me 130.5. Despite his network, Ed also had the highest net worth, with 284. So, although the end game wasn't very exciting, the championship game went quite well, and revealed some interesting dynamics. The moral of the story, I think, is that everyone should use the GM's railroads as much as possible. Overall, we had an excellent turnout. 75 different people played in 28 preliminary games; all but three of these were four-player. 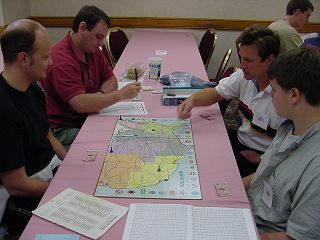 There were 26 qualifiers for the semi-finals (Ron Secunda and your GM both won two preliminary matches), of whom 24 appeared for the semi-finals. After some GM/assistant GM discussion, we decided to include six alternates in the semis rather than limit ourselves to the planned five 5-player games (and thus only one alternate). 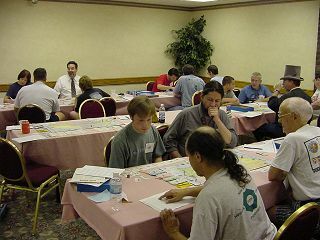 So the semi-finals consisted of six 5-player games, with each winner advancing to the final. I don't know what it means, but I note that none of the alternates won a semi-final game. 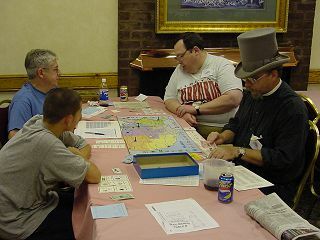 All games played used the Home Swapping variant. In most cases (regardless of the championship game!) this allows each player to get off to a decent start. Possibly because of that, we had very few bankruptcies; I'm aware of only two, both in the semifinals. And the majority of games were finished in a timely manner; of the 28 preliminary games, only 11 went past the allotted time (one hour per player, so usually four hours), and six of those ran less than 30 minutes over.